STROLLING THROUGH THE offices and warehouses of a certain AV importer in Auckland today, I encountered a vision from the past and had to wonder if I was hallucinating. Open a copy of Stereophile magazine from the ’80s and you’re likely to see an advert for Aragon amplifiers. 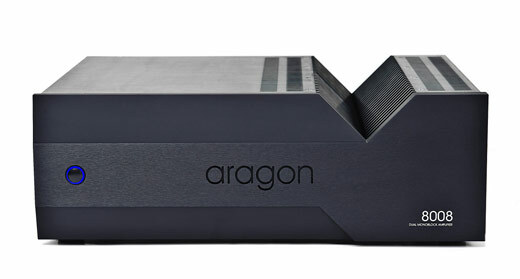 The Aragon amps in the ads are instantly recognisable thanks to the deep “V’ of heatsinks that runs down the chassis. I’ve always liked the look of these big American amps but had never heard them, let alone seen a set. Until today that is, where I encountered the reborn Aragon in the form of the 8008, which is a single chassis 200 watt stereo unit that’s described as a “dual monoblock” amplifier because of the way the two amplification channels are separated from each other.